Cyclists want safety, and this means more and better-connected bike lanes, especially on busy streets, according to research with community cycling groups conducted by student researchers from the Edwards School of Business. The students are part of Maureen Bourassa's third year marketing course. Judging by the feedback, it may be the toughest one she teaches, but it's also the most rewarding – both for students and the community. "It's extremely condensed and the students often comment that it's a heavy workload compared to their other classes, but they also say they get so much out of it," said Bourassa, assistant professor in the Edwards School of Business. Intended to teach students research design, methodology and analysis, the class produces real-world results for clients in the community. Each year, Bourassa looks at community groups that might benefit from marketing research, to get answers and information that isn't readily available and that they lack resources to get for themselves. For student Derek Hoium, the real-world connection was inspirational. "It was probably one of my favourite classes, because you are working with a client and you see the appreciation," he said. "The hard work is actually going to help someone else as well rather than just getting graded." To identify possible clients, Bourassa worked with staff at Station 20 West, who helped find connections to organizations the students could work with. They also provided meeting space and both staff and graduate student facilitators for meetings and presentations. "It's a very supportive environment," Bourassa said. "The class wouldn't be the same without that connection." This past year, two-wheeled transport was the theme. The students worked with community partners Saskatoon Cycles, Bridge City Bike Co-op, and the Campus Cycling Club. Hilary Gough, co-chair of Saskatoon Cycles, said their group's initial list of questions was a long one, but they pared it back to two essential themes. The first was their own members: who they are, where they live in the city, and what issues are priorities for them. The second was the community at large. Hoium and his team focused on the membership. While a core group of members was very active in the organization, the broader membership was a bit of a mystery. "(Saskatoon Cycles) really wanted to understand, ‘who are our members as far as demographics go?' ‘what do they think?'" Hoium said. The goal was to make sure the organization was aligning its activities with the priorities and desires of its membership. Under Bourassa's guidance, the students designed an online survey to gather information on member behaviour – when they like to cycle and why; what keeps them from cycling, and what gets them to ride more. They also asked them specifically where the organization should be applying its resources. Hoium said certain themes emerged from his group's work. Saskatoon Cycles members were motivated by the health and environmental benefits of cycling, as well as practical issues such as avoiding the hassle of finding scarce parking for a vehicle. A few common factors kept them off their bikes as well. "We found that the majority of the barriers to cycling are infrastructure: lack of bike lanes, multi-use trails, connecting bike lanes within the city, that sort of thing," Hoium said. Saskatoon Cycles also engaged a second group of students for a project aimed at city residents in general. "We wanted to know what the perceptions of people in the city were around cycling, particularly around what the barriers are to cycling in Saskatoon," Gough said. Marketing student Emma Clark and her team sat down with Gough's group to refine their survey questions and discuss their goals. "They wanted to know why people weren't cycling in Saskatoon, and more specifically, what the main barriers were to cycling," she explained, with the aim of coming up with strategies to better help Saskatoon residents consider biking as a feasible transportation option. The marketing students surveyed a sample of the population. They presented their findings at a community-researcher forum at the university's Community Engagement Office at Station 20 West. "Our most important conclusions were that cycling infrastructure and weather are the main barriers to cycling in Saskatoon," Clark said. "This led to us recommending more bike lanes in the city, specifically on 8th Street and College Drive, as they were rated as the streets that respondents would most prefer to have bike lanes on." For Saskatoon Cycles, the students' findings provided some clear targets on where to focus the organization's efforts. Gough explained that the desire for dedicated bike lanes clearly points to an underlying issue. 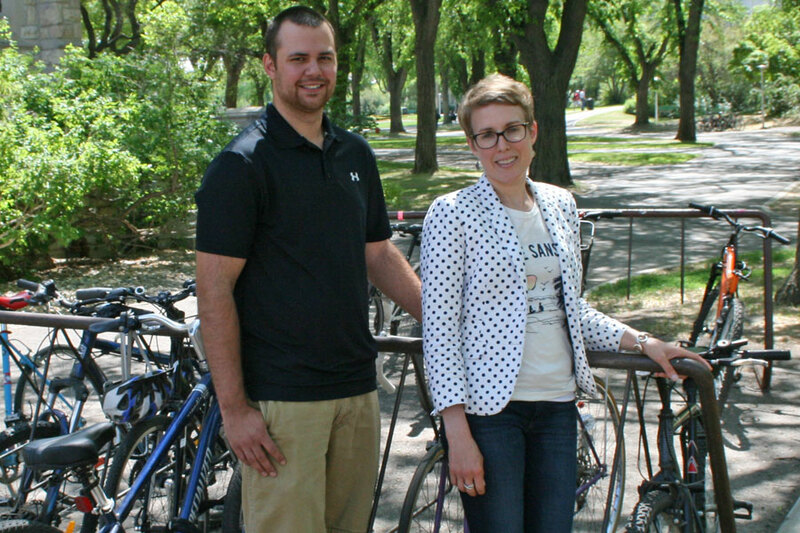 "Safety is clearly a huge factor in residents' decisions to get around by bicycle or not, and Saskatoon Cycles will continue to address this issue head on," she said. This aligns well with data from the Saskatoon Cycles membership, which also lists safety as a high priority. As an organization, the group has also identified other areas on which to focus. Gough said the group will continue to make deliberate efforts to, for example, cover more demographic groups both within their membership and among those they are reaching out to with their advocacy efforts. "We have work to do to increase the diversity of our membership," Hough said. "This is important."